A dip in the hot water levels could mean the presence of sediments in the water heater. 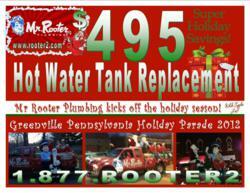 Super holiday savings to prevent a small problem from turning into a larger plumbing issue. According to Bob Beall, owner of the family plumbing service in Pittsburgh Pennsylvania and Youngstown Ohio, "This is one of the deepest discounts we have ever offered at Mr Rooter Plumbing! We wish you and your family a happy holiday and to celebrate we are offering our largest, super holiday saving event in our history!" A timely check-up can help prevent a lot of trouble. A small problem in any part of the plumbing might represent a larger issue with the entire plumbing system. A slow drain might be a sign of a blocked pipe or a dip in the hot water levels could mean the presence of sediments in the water heater. Mr Rooter Plumbing, the most referred and trusted Pittsburgh plumbing repair service knows all the nitty-gritties of plumbing issues. To help you diagnose the problem before it grows into something more serious, we provide you with a complimentary plumbing check-up during all of our service visits. Just ask your plumbing technician. "Every customer’s individual needs are important to us at Mr Rooter Pittsburgh Plumbing. Our focus of providing courteous, fast and front line plumbing services and products combined with honesty has made us the first choice-most referred plumber in the area," says Beall. You can count on Bob Beall, Pittsburgh’s Mr Rooter, to take care of your plumbing and drainage needs 24/7 every day of the year. Beall offers the FREE second opinion and never charges for overtime. Beall ‘s goal is to provide affordable costs to homeowners for any of the services they may need, many of which might occur unexpectedly. Mr Rooter coupons help to achieve this goal, as well as expert plumbing advice offered daily to homeowners. Mr Rooter prides itself on excellent customer service. Fast, courteous and front line services is what you should expect. We guarantee that is what you will get and our customers always know the price before we start. Established in 1970, Mr. Rooter® is an all-franchised, full-service plumbing and drain cleaning company serving 2.9 million consumers in the Northeast Ohio and Southwest Pennsylvania region. Recognized by Entrepreneur magazine among its “Franchise 500” and Franchise Times Top 200, Mr. Rooter® provides services to both residential and commercial customers. 24/7 emergency plumbing repairs call 1-877-ROOTER2. For more information or to schedule an appointment, please visit our Web site at http://www.rooter2.com . Follow Mr. Rooter on Twitter (https://twitter.com/mrrootermedia ), or like Mr. Rooter on Facebook (http://www.facebook.com/MrRooterPittsburgh). Mr Rooter currently serves seven major Southwest PA counties: Allegheny, Armstrong, Beaver, Butler, Fayette, Sharon, Mercer, Washington, and Westmoreland. Mr Rooter Youngstown serves three major Northeast OH counties: Columbiana, Mahoning and Trumbull.